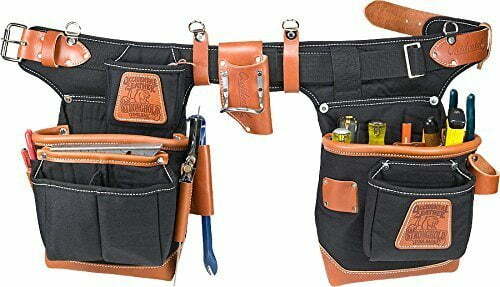 Any good carpenter knows that an accessible, useful carpenter’s tool belt is a necessity on the job. A tool belt grants quick access and organization for a carpenter’s most-used tools and gadgets, especially when doing work off the ground. It’s hard to do your job right without a proper tool belt – no one will take you seriously if you’re up and down a ladder all day for the right tools. There are many different styles of tool belts to choose from, from the most minimalist to the utterly all-inclusive, from the most expensive to the very budget-friendly. There are several different tool belt configurations that carpenters can use, and these vary depending on the job you want to do. In the video above, the carpenters both wear an over-the-shoulder style tool belt, which is mainly a stylistic and functional choice. A tool belt with straps will not fall down your hips as a standard belt might, but it’s a bit more restrictive. Apart from form and function, though, you should choose your tool belt mostly based on the job for which you need it. 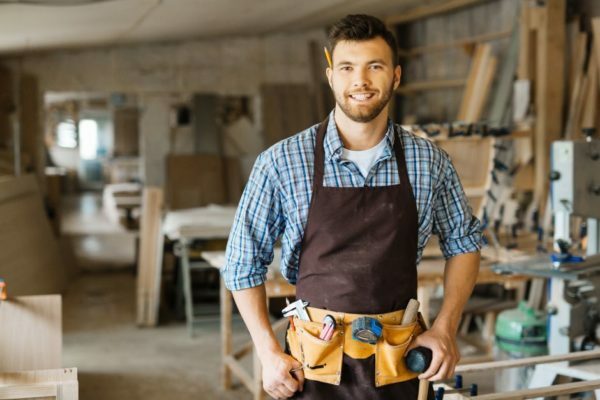 You may have multiple different tasks to do that would benefit from a more universal or customizable setup, or you might exclusively do one thing that would work well with a very specialized tool belt. There are belts available for both of these needs. Which belt you choose also depends on what tools you want on your person. A plumber or electrician, for example, would have very different tool belts than a carpenter would. The stuff your carpenter’s belt is made of makes a big difference in how it functions on the job. Some carpenters prefer the feel of one material over another, some prefer the look of one, while some are most concerned with durability. Price can also be a contributing factor. You should think over all of these things before you buy your tool belt. A sturdy carpenter’s belt with leather is an excellent choice for carpenters by profession. Generally, the longest-lasting belts will be all leather or a hybrid of leather and nylon, and the pockets will usually be sewn onto or otherwise attached to the belt itself. Sewing them on makes them much sturdier than fabric belts, and the belt will take years of punishment. For someone who uses a carpenter’s tool belt day in and day out, this will be a great choice. However, permanent leather belts will generally be more expensive to purchase up-front. If you’re only a hobbyist carpenter, you may not need the extra sturdiness that it provides, and the price might be prohibitive. For the hobby or part-time carpenter, a fabric tool belt may be your best bet. These belts are generally not built to stand up to the same punishment that leather can, but they’re much cheaper to buy. If you don’t plan to wear it every day, one of these belts should be plenty for your needs. A key benefit of fabric belts is their customizability. Often, the pockets on a leather tool belt will be riveted to the strap itself, or it might all be one piece. For fabric belts, you can usually take pockets off the belt as needed, or even add more. While some tool belts styles are not made to be customized, many of the ones available now are specially made to be interchangeable. You can buy and attach pockets, straps, clips, and other useful parts when needed. 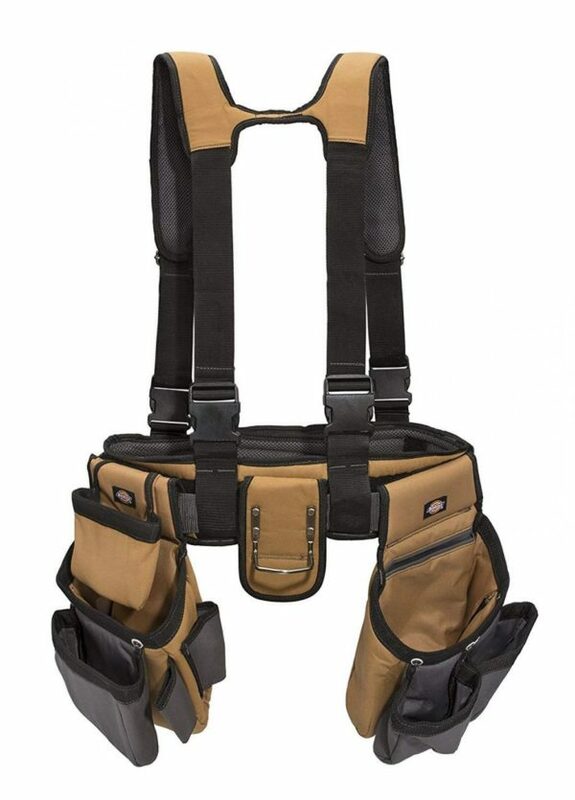 An over-the-shoulder (or suspender style) tool belt is a unique configuration that many carpenters prefer for heavy tools. As you might imagine, a standard belt might make its way down your hips if you’re carrying a heavy load in the pockets. If you’re carrying tools like drills or hammers up and down a ladder, like when framing an upper level on a house, this may be the belt you want. Suspender style tool belts have the added benefit of distributing the weight of the belt across your shoulders. Some of them also have a specialized strap in the back that further balances this weight and helps you avoid back pain. The downside of suspender belts is that they’re much harder to configure and put on. A belt with a simple buckle or clasp will be easy to take on and off, but a suspender attachment has straps to contend with. These may need adjusting or unfastening whenever you remove or put on the belt. The suspender style might also not be the best choice in hot weather. If you’re already sweaty, having suspenders on over a sticky shirt will only make things feel worse. However, most suspender attachments are removable, assuming your belt will stay up without them! If you can’t find a tool belt that suits your needs, you can build one yourself from the ground up! Many companies sell pockets ready to put on a belt, so you can use a belt you already have or buy a specific one that you like. This option will have the most customization. However, keep in mind that the pricing on this option can be variable. If you choose cheap pockets and belts, you may end up with a very inexpensive belt in total, but the quality might be lacking. Alternatively, if you buy expensive pouches, you might have a very costly but sturdy belt when all is said and done. This build-your-own option is useful for special projects, such as for making a child’s tool belt. You can buy one or two small pockets, then you can affix them to a smaller belt than you’d typically be able to buy. You can also move these pockets to larger belts as the child grows this way. Although there are many options to choose from, you should now have some idea of what you’re looking for, whether it be just attachments, only the material, or the whole setup. Here are some of our top picks for carpentry tool belts. This tool belt set is all-inclusive, durable, and affordable. You’ve probably bought Dickes brand clothing before, too. They’re a trustworthy brand that I would feel comfortable buying myself. This product would be our best recommendation for someone just starting out. The price is not prohibitive, it comes with a decent selection of attachments and features, and it’s attractive to look at. The suspender attachment is also removable so that the belt can be worn with the suspenders or alone. This work belt is made mostly of nylon, which makes it one of the sturdier options available out there. Nylon is more than sufficient for a hobby carpenter who doesn’t use the belt every day. The belt also has a moisture-wicking mesh lining on the belt and suspenders, making it an excellent choice for hot climates. Unfortunately, some parts of the belt seem low quality. The suspenders on the belt, for example, are attached by large plastic clips, which hang in the way when the suspenders aren’t connected. The pockets on this tool belt are situated towards the back of the belt and aren’t meant to be moved toward the front. This placement may be a deal-breaker for carpenters who prefer more of an apron-style belt. The belt is easy to set up and put on, is adjustable to different waist sizes, and comes in two color options. However, it looks more like a beginner or hobbyist’s belt, and it seems to be missing pockets that some carpenters like. However, for someone who wants to jump into carpentry with a full-featured belt right away, this is an excellent choice. 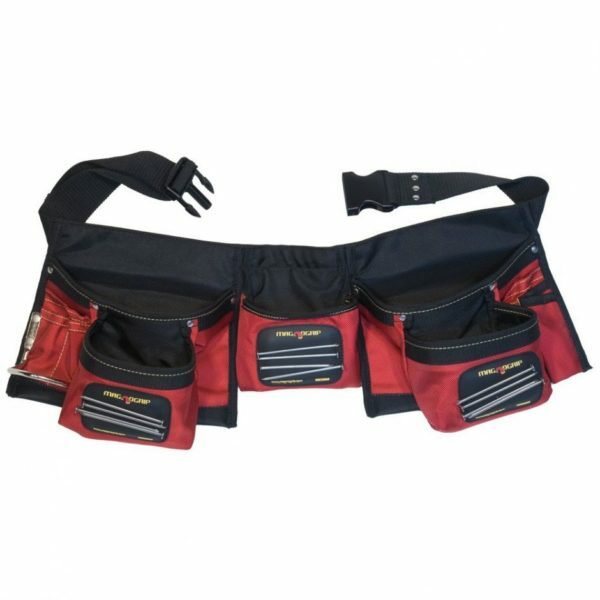 The MagnoGrip tool belt is our choice as the king of affordability and simplicity. It’s an apron-style tool belt, so all the pockets are on the front for easy access, and it has magnets embedded in the pockets. These magnets help screws and nails stay in place when you’re moving around or bending over. If you often work with screws, bolts, or other metal pieces, this may be especially useful for you. The MagnoGrip tool belt is also our most affordable pick. It’s a fantastic choice for the builder on a budget, and the magnetic pockets provide an extra perk on top of the price. However, it’s made of polyester, so it may not stand up to the abuse that more durable tool belts can. Additionally, if you don’t often work with metal, the magnetic parts might not be useful to you. This tool belt also doesn’t have any suspender attachment included, nor does it have loops or clips on which to put one. It also isn’t meant to hold many heavy tools. You would need to sew on loops or rings to attach suspenders. The belt itself also may not be heavy-duty enough for some people. The belt only has the simplest of pockets, so a carpenter looking for a full-featured belt might be disappointed. However, it may be a good alternative belt to keep around specifically for working with nails, screws, and the like. The tool belt isn’t customizable, either – the pockets are sewn in place. Magnetic pockets are perfect for screws, nails, etc. The Gatorback Carpenters Triple Combo Belt is one of the most well-rounded options available. The tool belt is made of Duratek Nylon, making it very durable, and it’s reinforced with rivets in areas of high-stress. This belt is made to hold up for a long time. Furthermore, it has a full one-year warranty against defects for your peace of mind. This belt has one of the biggest assortments of pockets and loops of any that we’ve reviewed, so there will be a place for all of your tools. On top of that, the pockets are fully removable from the belt, so you can add and replace them as you like. You can also reconfigure them to different parts of the belt to suit your needs better. The belt has suspender loops included. You can buy your own suspender attachment for these, or you can buy the deluxe belt package (with suspenders and other extra features) for slightly more. This tool belt is not the cheapest one we’ve seen, but it makes up for that in quality. However, the price also isn’t so high that it’s prohibitive. It’s much less expensive than leather tool belts, and it should hold up to punishment nearly as well. An occidental leather tool bag is the longest-lasting option for carpenters. 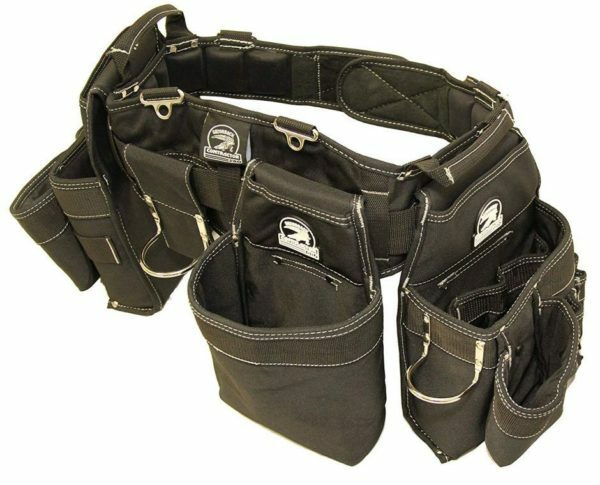 This option is a hybrid tool belt, made with nylon and neoprene supplemented with leather in high-impact areas. This hybridization helps keep the weight and price of the belt low, while still maintaining maximum durability. This belt will undoubtedly hold up the longest, but it’s also the costliest. Unless you plan to use it every day, this belt may be more than you need. Hobby carpenters will likely not need the level of durability this belt provides. This belt is the only one we selected that comes in both right-hand and left-hand options. This option may be especially important if you are a left-handed builder. However, you can remedy this yourself on a configurable belt by merely moving the pockets around. The leather on this belt provides the most attractive and professional look of all of the belts we’ve featured. Traditionally, leather is the most tried-and-true material for durable tool belts, and someone who likes the leather look may find it worth the price. A proper tool belt is essential for a carpenter who wants to do their job well. Not having one simply isn’t an option. A tool belt provides the carpenter with easy access to commonly-used tools, like a hammer, nails, measurement tools, and pencils, saving precious time and helping them to work faster. The Gatorback Carpenters Triple Combo Belt was our favorite tool belt out of all the ones we reviewed because it’s a sturdy, functional belt at a middle price point with an included warranty. It’s not the cheapest option available, but it’s also not the most expensive, either. Moreover, it will fit the needs of both the professional and the hobbyist. We think that it’s the best option for any carpenter looking to get the job done in style.